John Ringor appeared most recently on Show 220, recorded in October 2010. 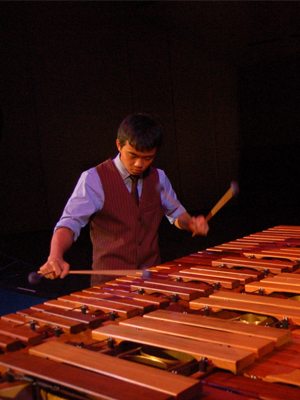 Percussion Scholarship Group Marimba Duo is comprised of Marcelina Suchocka, age 16, and John Ringor, age 16, both from Chicago, Illinois. Marcelina is a recipient of From the Top’s Jack Kent Cooke Young Artist Award. Marcelina and John appeared on From the Top in November 2009 as part of a larger ensemble of the Percussion Scholarship Group where they study music. Marcelina attends Whitney M. Young Magnet High School where she is a junior, and John is a junior at Northside College Prep High School. The duo is coached by Douglas Waddell. John is a Jack Kent Cooke Young Artist. 2012 YoungArts Finalists – Lots of From the Top Alumni! John Ringor, Joshua Jones, and Fellow PSG Members Show Chicago Youth that Rhythm is It!